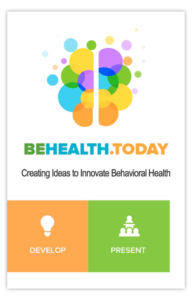 BeHealth.Today provides an opportunity for people with lived experience, family members and community groups to collaborate with others interested in generating new ideas to innovate behavioral health in San Diego County. There is no cost to participate in any portion of this process, and everyone is welcome to participate. For complete process information, click here. For frequently asked questions, click here. To contact BeHealth directly, click here. Register for 1/15/2019 | 3:00-4:00pm Jacobs Center for Neighborhood Innovation, 404 Euclid Ave, San Diego, CA 92114. Register for 2/13/2019 | 3:00-4:00pm Chula Vista Public Library, Civic Branch, 365 F Street, Chula Vista, CA 91910. Register for 3/6/2019 | 3:00-4:00pm North Inland Live Well Center, Rooms A, B, C & D, 649 W Mission Avenue, Escondido, CA 92025. Register for 1/23/2019 | 10:00am-2:00pm Jacobs Center for Neighborhood Innovation, 404 Euclid Ave, San Diego, CA 92114. Lunch will be provided for registered participants. Register for 2/21/2019 | 10:00am-2:00pm Chula Vista City Hall, HR Training Conference Rooms (B111 & B112), 276 Fourth Avenue, Building C, Chula Vista, CA 91910. Lunch will be provided for registered participants. Register for 3/14/2019 | 9:30am-2:00pm North Inland Live Well Center, Room B, 649 W Mission Avenue, Escondido, CA 92025. Lunch will be provided for registered participants. A two-hour presentation of proposals for consideration by potential funders. Register for 2/5/2019 | 2:00-4:00pm Jacobs Center for Neighborhood Innovation, 404 Euclid Ave, San Diego, CA 92114. Register for 3/7/2019 | 2:00-4:00pm Chula Vista Public Library, Civic Branch, 365 F Street, Chula Vista, CA 91910. Register for 4/4/2019 | 2:00-4:00pm North Inland Live Well Center, Room D, 649 W Mission Avenue, Escondido, CA 92025.